East bound and down, loaded up and truckin! 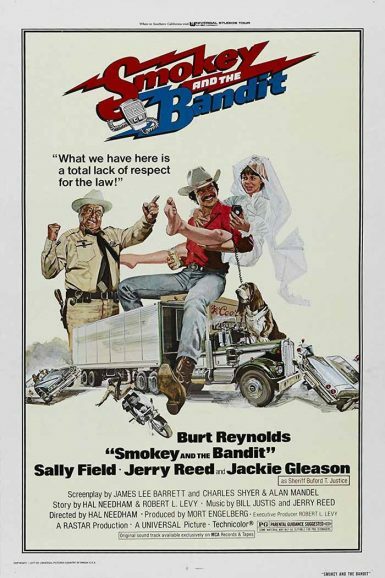 Burt Reynolds, bootleggin’ buddy Jerry Reed and runaway bride Sally Field put the pedal to the metal, running a trailer full of Coors beer across State lines with Jackie Gleason’s Sheriff Buford T. Justice in hot pursuit in the blockbuster comedy Smokey and the Bandit. Known for his sports movies that aren’t really about sports, Michael Ritchie delivers another soulful classic with Semi-Tough. Burt Reynolds and Kris Kristofferson are two hotshot Miami football players living in a ménage e trois with the owner’s daughter (Jill Clayburgh). But when deep feelings develop between two of them, their whole arrangement, and the team’s playoff aspirations, are put in jeopardy. When the big game isn’t the Super Bowl, but the game of life, either you get it or you don’t. Featuring Robert Preston as the eccentric owner who keeps recommending new age treatment and jargon to the jaded star players.